It started with a simple question: How many Multiple Listing Services are there in the U.S.? The problem was that, up until just a couple of years ago, no one knew what the precise answer was, not even the National Association of REALTORS, and they’ve been tracking MLSs for decades! That question spawned a discussion in the RESO Research & Development Workgroup around creating an Organizational Unique Identifier, or OUID. Two very active RESO volunteer members – Bill Kellogg, Chief Information Officer of ShowingTime and Greg Moore, Chief Technology Officer of Regional Multiple Listing Service, Inc. (RMLS) in Portland, Oregon, who Chairs the R&D Workgroup (video overview of this Workgroup is at https://youtu.be/pxVpo46FYwc) – joined forces to help RESO take on this business challenge. Together, Moore and Kellogg helped lead an effort that created the RESO Organizational Unique ID and its accompanying API and underlying database. Most importantly, this API is made available to anyone for free – not just RESO members. 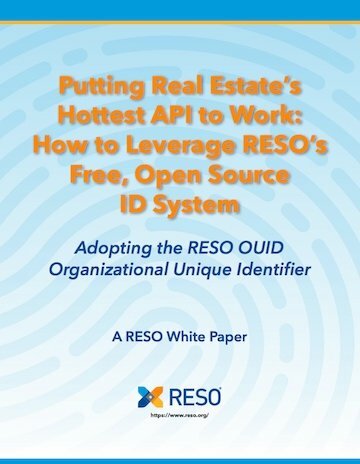 Today, the RESO OUID and its API is being used broadly in the industry as RESO members are finding innovative yet practical ways to use this data to solve many different business challenges. Downloadable in an 11-page PDF format, this new white paper reviews how the OUID and its API came about, the business case for the OUID, how it is integrated into the RESO Data Dictionary, as well as the variety of ways different sectors of our industry can use the data. The hallmark feature of this white paper is how quickly and broadly the real estate industry has leveraged the RESO OUID and its API. Six companies are profiled as examples, with all six firms using the data for very different purposes. The companies profiled using the OUID and the API include two real estate brokerages – RE/MAX and NextHome, two tech firms – ShowingTime and Homes.com, and two consulting firms, WAV Group and T3 Sixty. The white paper provides a mini case study of each firm’s use of the RESO OUID and how they are leveraging the data to benefit their businesses. For example, Bill Kellogg at ShowingTime was a user of the RESO OUID “before it was released!” Kellogg started using it as soon as it was created – even before it was published – as he had an immediate need. “We had just acquired Showing Suite, and we used it for the internal conversion between the two companies,” Kellogg explained, noting that both ShowingTime and Showing Suite were national firms and they needed a single source for identification reference. “We wanted one source instead of having some ambiguous lookup table, so this (RESO OUID) was a good approach for us,” Kellogg said. The RESO OUID also has helped ShowingTime with data share needs as well as clearing up MLS name confusion and duplication. As the white paper notes, Kellogg explains that you’ll find multiple MLSs or associations that refer to themselves by a code of “METRO” in data. “Columbus Board of Realtors exists in Georgia, Nebraska, and Ohio,” he said, adding, “Resolving that is painful.” And that’s where the RESO OUID helps eliminate the pain. The new RESO OUID white paper in PDF format is free to download here. Other recent RESO white papers and case studies can be found on its website at https://www.reso.org/reso-case-studies.